When it comes to most things, Alaska is a small state. Everyone knows everyone. Heck, in many cases political allies and adversaries are often related. That’s the risk in campaigns hiring out of state political operatives. Getting the lay of the land can take awhile. That appears to be a lesson Independent candidate for U.S. Senate Margaret Stock is learning this week by way of the school of hard knocks. 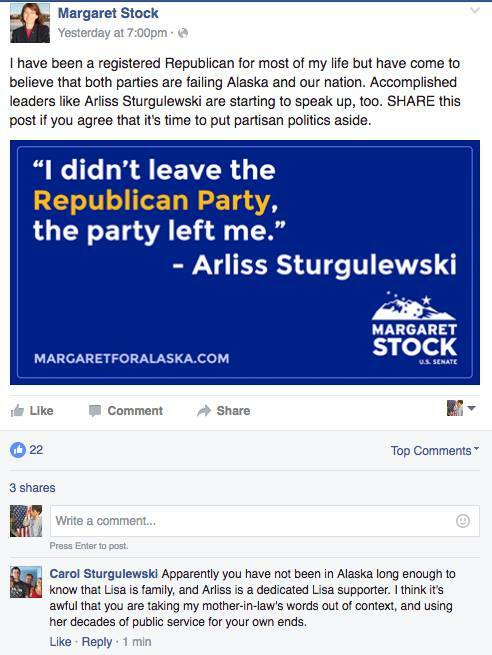 On Wednesday, Stock’s campaign thought they had a rhetorical winner when they clipped quotes made by Alaska elder stateswoman Arliss Sturgulewski in a recent Alaska Dispatch News commentary detailing the disaffection several old-time Alaska Republicans felt toward their party. 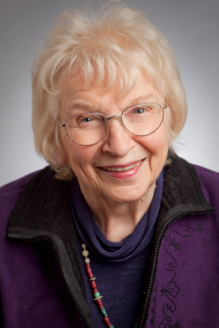 For our younger readers not familiar with Arliss, she is an Alaska elder stateswoman who served on the Anchorage Charter Commission, in the Alaska State Senate from 1979-1993, and was the Republican nominee for Governor in 1986 and 1990. The quote was a message the Stock campaign thought fit nicely with the narrative she is trying to construct as a former Republican so dissatisfied with the status quo of political partisans she changed her party registration to non-partisan. Stock’s campaign clipped the quote, created a graphic, packaged into an email, and sent it out and posted it to social media. All good, right? Not so fast. Apparently no one on Stock’s staff contacted Sturgulewski to ask if she was ok with being used in a manner that suggests she supports Ms. Stock or her message. In an interview this morning the 88 year old Sturgulewski made it clear she isn’t taking kindly to Stock’s actions and it appears neither is her family. Sturgulewski has long been one of Murkowski’s staunchest supporters. That support makes sense given both Sturgulewski and Murkowski’s brands as moderate Republicans with a track record of running as much against the hard liners in their own party as as against Democrats. It also makes sense given Sturgulewski and Murkowski are family. 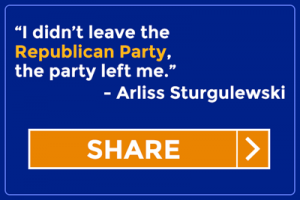 In fact, Carol Sturgulewski — who happens to be both Arliss’ daughter-in-law and…..wait for it…Lisa Murkowski’s sister— took very sharp exception to Stock using Arliss’ name in her campaign. That comment was quickly deleted by Stock’s campaign. 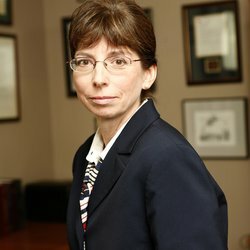 Sturgulewski says she has left a message with Stock’s campaign telling them of her objections to being used in their materials, but as the writing of this story the posts featuring Sturgulewski remain posted to Stock’s social media pages and no correction email has been sent to Stock’s supporters. 2 Comments on "Sturgulewski To Stock: Keep My Name Out Of Your Mouth"
position contrary to her daughter-in-law’s reelection. Agree with TeBay. Just because you quote somebody, it doesn’t mean that they endorse you. People quote George Washington, Thomas Jefferson, Abe Lincoln, Mark Twain, FDR, Winston Churchill, JFK, Confucius, Clint Eastwood, and Samuel L. Jackson all the time, and nobody considers it an endorsement. Arliss Sturgulewski should maybe feel flattered that somebody thinks that she’s admirable enough to be quoted. Best way to have dealt with it would have been to make a humorous announcement saying that she was honored by the attention, but that she’s definitely a Murki supporter……….all with a smile. I was actually pretty impressed with Ms. Stock the one time that I heard her speak………….I’d like to see a debate between her and Murkowski.